Celebrating 70 Years Of Porsche! Seven decades of automotive innovation…what a ride it’s been! While Porsche’s parent brand Volkswagen was founded several years before the first Porsche vehicle was registered, the same German roots run through (or should we say, drive fast through) the blood of these incredible machines. 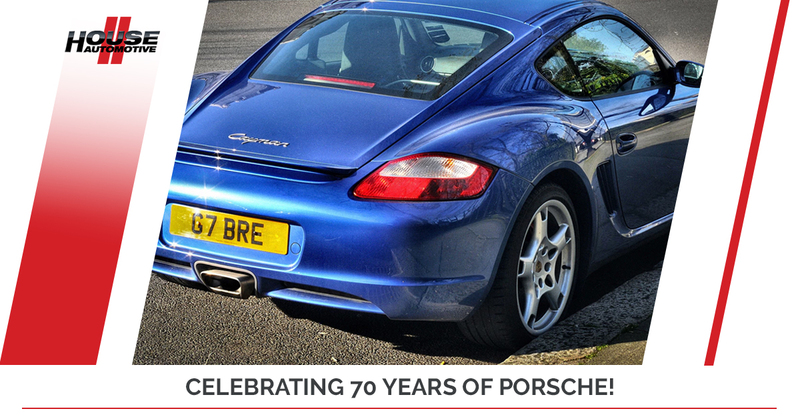 Truly, 70 years of creating some of the very best-looking and best-performing automobiles on the market is something worth celebrating! That’s why HOUSE Automotive is dedicating this blog post as a Porsche appreciation post, highlighting Porsche’s big 70 year anniversary. Our favorite car manufacturer can be considered an elderly citizen at this age! At our independent Porsche repair shop, we take great pride in representing the Porsche brand in all that we do. From simple Porsche oil changes to a full-on engine rebuild, one thing remains constant about the work that we do: we’re working on Porsches, the very soul of German engineering. That’s what moves us. What moves you? Learn about some more history behind the Porsche brand by reading below in today’s special commemorative blog post. If you’d like to learn more about HOUSE Automotive and our specialized Porsche repair shop, this is where you want to visit. As always, feel free to reach out and get in touch with us if you have any questions, or schedule an appointment today for Porsche service in Pasadena! Surely, it must be quite the honor to bear the title “No. 1.” That was Porsche’s very first model, registered back on June 8th, 1948. The brand considers this the official birthdate of Porsche, the day finally turned Ferdinand Porsche’s automotive dreams into a tangible, driveable reality. The Type 356 embodies the values, heart and soul of the Porsche brand, especially coming from their original roots with Volkswagen. In a sense, you could call us a proud, distantly-related uncle of this original piece of beauty. As people who actually work and repair Porsches day in and day out, we couldn’t agree more with Blume’s kind words about the Porsche legacy as set by Ferdinand Porsche himself. While automotive technology and engineering have become much more complicated and complex since the 1940s, the original soul of the brand is not lost. If anything, it’s just improved over time. Though the Porsche brand was officially founded in 1948, the groundwork in which the brand was built from is all thanks to Professor Ferdinand Porsche’s work. His son, Ferry, continued his legacy, but it was Ferdinand that developed game-changing automotive innovations as early as 1900. In 1900, Ferdinand built an electric car that featured what was then the world’s very first all-wheel-drive system for a passenger vehicle. In the same year, Ferdinand also managed to create a template for hybrid vehicles using a combination of electricity and gasoline power. In 1939, Ferdinand’s engineering feats became tangible with the “Berlin-Rome Car,” what’s known as the pre-Type 356, if you will. Eventually, the 911 became the successor to the 356, designed by Ferry’s son, Ferdinand Alexander (we understand if all of these names are a little bit confusing). The 911 debuted to the public in 1963, and well, the rest is history characterized by blinding speed and looks to kill. Of course, there’s far more detail behind the Porsche story than what you just read, but we hope that this served as a fun celebration post! Make Ferdinand Porsche proud and take good care of your own Porsche and visit HOUSE Automotive today. Here’s to another 70 years of automotive excellence! View Our Porsche Care Guide Here!